UK figures show that thefts from garages, sheds and gardens increased by 10 per cent over the last year, and are up almost 20 per cent compared with the figure from five years ago according to the Office for National Statistics. Naturally, most homeowners will store expensive tools and equipment which together can be worth several thousand pounds in a shed or garage which isn’t properly locked. Opportunist thieves will happily target these areas knowing they will get away with it. In 2012, 42% of thefts were for power tools, of which 56% were drills 39% were for simple hand tools like spades, shovels, rakes and forks and 19% were for electric and petrol lawnmowers, chainsaws and ladders. So what can you do as the dark nights draw in? Put away all tools and equipment and ensure that all outside sheds and store cupboards are securely locked when not in use. Buy a good quality affordable and easy to use outdoor security camera such as D-Link’s wireless, (DCS-2332L) which is easy to install, connect and monitor. Do not leave items in your garden. e.g. ladders, which could be used to gain access to your home. Bring the tools inside if you do not have a garden shed or outbuilding. Install outside security lighting which comes on automatically. Mark your property with your postcode or with a property marking system like SmartWater. This makes stolen property easier to trace, harder to sell on and it can be positively identified as yours. 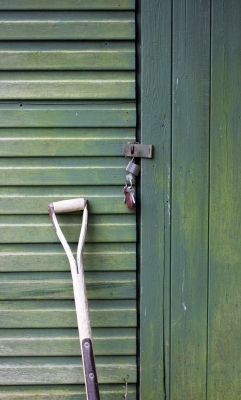 Check that your household insurance policy covers theft from your garden and outbuildings. If possible always place valuable items out of sight in the rear garden and in all cases avoid putting them close to the perimeter area of the garden where they are more easily accessible to thieves. Make sure garden furniture and barbeques are securely stored after use, in the garden sheds or garages, if they are mobile. Ensure your garden gate is kept closed and is locked from the inside. This entry was posted in Consumer and tagged DCS-2332L, IP surveillance by D-Link UKI Blog. Bookmark the permalink.